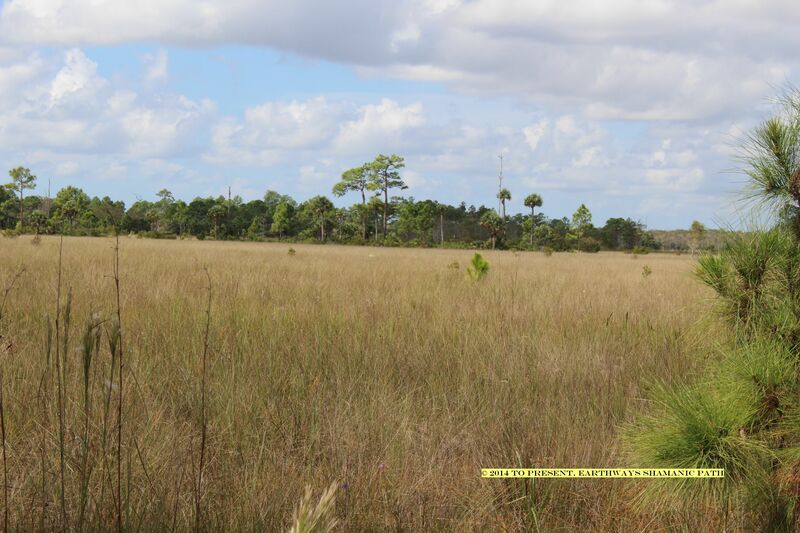 Honorable Shamans and Fellow Pagans… Oh, Dry Season is coming to Southwest Florida! We’re excited to leave the Heat and Humidity and Daily Torrential Rainstorms of Hurricane Season behind us. Particularly the Heat. And the Humidity. But first, here is a ritual to close out Hurricane Season. You may complete this Ritual, over the course of several days. You may do some of it with family members, and some of it by yourself. First, put your Hurricane Supplies away. Inspect and clean all your equipment that you got, and put it away. If you have a generator, follow the instructions to prepare it for long-term storage. Maybe you can put a tarp over your Storm Shutters. Make sure your wingnuts are all packed up in the wingnut bucket. Visit your “To Go” box, and make sure you haven’t left any trash in it. Make sure to leave a road map of your State or Region in there, and maybe this year’s Storm Guide. The Storm Guides are usually good for all kinds of disasters, and it is good to have a plan. 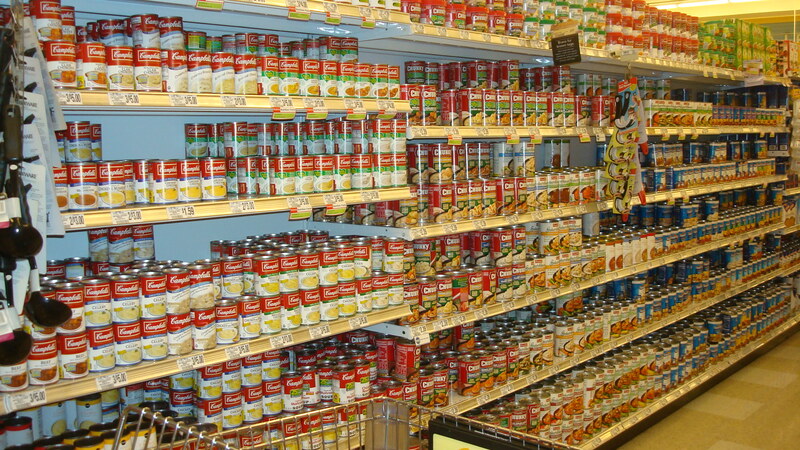 Second, bring a sturdy box to your supply of canned food and inspect those cans. (Inspect the expiration dates.) Are there some that you want to donate to a local food pantry? This is an excellent time to do this, because after Hurricane Season ends, and the Dry Season starts, our Snowbirds will arrive and the food pantries need more canned foods. You can also empty the water bottles you created – use them to water plants or your lawn, or your favorite tree. Release what is no longer needed. Third, review everything you learned this Hurricane Season about how storms are predicted and tracked, and how intense and unpredictable they really can be. Make some notes about what you and your family need to do in the coming months, to better prepare yourselves for next year’s Hurricane Season. Visit my previous posts to get an idea. Forth, review what happened to the people who were in harm’s way in the Lesser Antilles and Puerto Rico and Dominican Republic and Haiti and the Bahamas and Bermuda and South Carolina, and consider donating funds to a reputable disaster relief organization. Close out this Ritual as directed in the Stepping Stones. © 2015, Whale Maiden. All Rights Reserved. Honorable Shamans, welcome back. While Tropical Storm Danny is wandering around the Atlantic Ocean, let’s review the Hurricane Planing Checklist. Let’s assume your town is in the 5 day cone of probability and you now have 5 days to take appropriate action. You will have a lot to do. There are many Spiritual Lessons to work through in Hurricane Season. One set of lessons, is to ask for help, to accept help gracefully, and to offer help, as needed. Do Not Panic. Do Not Panic. Do Not Panic. One of the benefits of modern technology is that we have the ability to hear about Hurricanes for days — sometimes weeks — ahead of time, and take steps to plan accordingly. Your task is to be mindful of the approaching Hurricane without freaking out about it. Pick up the annual Hurricane Guide at your local hardware or grocery store, City Hall or County Admin building, library, etc. (You might find them on-line too.) These booklets contain Maps, locations of Shelters, Checklists of supplies, and other useful information. Read it. Read it again, then put it in your “To – Go” box. Check your “To Go Box.” After you take all your photographs and bless your house and chat with your neighbors, go inside and check your “To Go Box.” Normally, you probably keep copies of all your important files in a file cabinet or something, but if a storm is headed your way, you’ll want to transfer the insurance policies and copies of birth certificates and other important papers, into a plastic box. Put your maps in there, and your list of important phone numbers in there too. I use two-gallon zip lock type bags, which are perfect to store file folders. In 2004, I learned that Insurance Agent’s business can get hit by hurricanes, too, so it is best if you have your copies. This should go without saying, but, make sure your policies are paid up BEFORE the storm hits your house. Also, you’ll want to back up your computer files and transfer important files to a flash drive. When we evacuated before Hurricane Charley, we took the whole computer tower with us. How’s your supply of food and water? In the five days before a hurricane, count noses. Every animal that has a nose needs food and water during a hurricane. The amount of food and water you will need, will be based on upon whether you are staying home (shelter-in-place) or evacuating, (“We’re bugging out!”) Each mammal needs at least a gallon-per-being-per day. People need a lot of calories and comfort foods during a storm. Along with canned food, we recommend cola, chocolate, cheese, tuna and peanut butter. Also remember crackers, chips, bread. If you evacuate, take your food and beverages with you. Batten Down The Hatches -Or put up Shutters — When the storm is predicted to be a Tropical Storm, or greater, and you are expecting sustained winds over 39 MPH, you will want your home to have the windows boarded up, snugly. So, five days before the storm hits, if you have shutters, you’ll want to walk around and check the conditions of the shutter channels and bolts. Are there wasp nests in the channels? If so, you’ll need to SAFELY remove the nests. [My advise on that topic, ends here.] Are the bolts in good condition? Putting up Shutters is a labor intensive task, and is best accomplished with help. We like to drink highly caffeinated sweet beverages and eat candy bars with chocolate and nuts, before we start, so that we are hydrated and pumped up a bit. Hopefully, your notes on which shutter panels cover which window opening, survived the year in your garage. I have a special bucket that I leave on top of my supply of shutters in the garage. The bucket has the chart showing which panels go where, all the wing nuts (and you really should get a wing nut turner, like you said you were going to do, last year) and gloves. Everybody helping should wear a pair of thick gloves, and sun hats are smart, too. Drag the panels out of your garage, and put them in stacks in the shade. They are metal, and get hot quickly. Finally, remember that once you get all the panels up, it gets dark and quiet inside the house, so you may want to leave some of the windows partly open, until you are ready to button everything up. Also be careful once you are inside because Shutters do create a fire escape hazard. Putting tape on your windows is a waste of time. It doesn’t help, and the tape gunk never comes off. If you don’t have ready made shutters, you can use plywood, and the blue screws. Plywood is HEAVY and you will definitely need help. Stay hydrated and take rest breaks out of the sun. Where do you live? Most people know where they live. But this is an ideal time to find a map of your town, and State, and figure out where you are, and learn to compare that to where the predicted Hurricane Path is. How do you get maps? You can look up where you are, on the internet, of course. But for Hurricane Planning purposes, you should get a paper map so that you will have it when the power goes out. These are usually available at gas stations and even some pharmacies and grocery stores. You should also take the time to figure out your longitude and latitude, using that paper map. The most important thing to know is, do you live on a Barrier Island? Where is the Storm? Where is it predicted to go? It is useful to watch a good weather channel (I like The Weather Channel) and learn the lingo. Some news stations report the information posted in NOAA’s Tropical Prediction Center. This is an excellent resource to learn about Hurricane Tracking. The Tropical Prediction Center looks at hurricane models, and it conducts mathematical analyses to come up with a cone-shaped prediction. It is a Five Day moving target. The location of the storm is represented by the small nose end of the cone. The location of the nose end is more certain that the fan of possibilities represented at the wide end of the cone. It is really important to understand that the effects of the storm can usually be felt, outside of the cone boundaries. 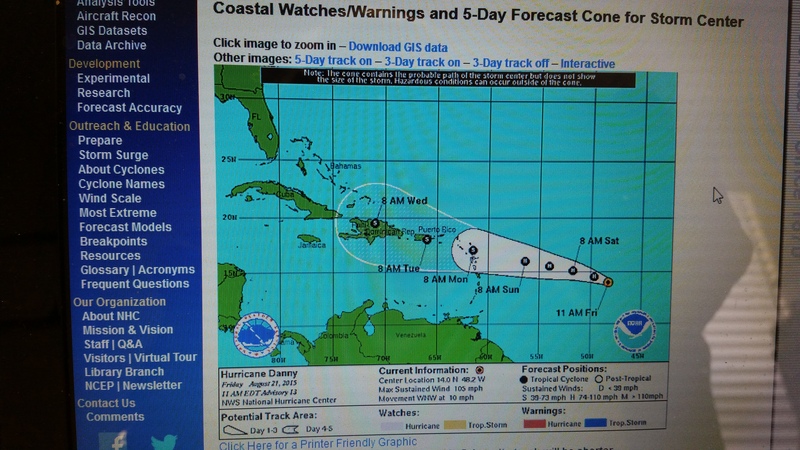 This cone is updated every 6 hours for a Tropical Storm. Remember, Everything Changes… The Spiritual Message in this Season is, Stay Flexible. Get a feel for where Hurricanes develop, and how Hurricanes act. In the Atlantic basin, Hurricanes tend to form in one of two places: either off the west coast of Africa, or, off the Yucatan Peninsula, or the north coast of South America. The ones that form just above the northern coast of South America, seem to kind of “blow up” in intensity in the Gulf of Mexico. From the Florida Perspective, these don’t have too far to go, so if Florida is in the 5 day cone forecast, we have 5 days to prepare, maybe fewer. These storms tend to develop in mid-August, because the Gulf of Mexico is very warm water in mid-August, and Hurricanes Love Warm Water. That’s different from the Hurricanes that come off the west coast of Africa, like bowling balls coming down the alley. Those are at least 5 days from land maybe more, and at least 6 or 7 days from the East Coast of Florida. (They may have no impact at all, on the West Coast of Florida. It all depends.) Depending upon the world wide weather conditions — like Hi Pressure zones and Low Presser Zones, and various waves– these storms will either (a) get about half-way out to the middle of the Atlantic and then head north – we call those “Fish Storms” or, (b) the storm will head towards Hispaniola (the island where you’ll find Haiti and the Dominican Republic) and dip down, towards the southern part of the Caribbean sea, or, (c) the storms will skim the top of Hispaniola, and then hit Cuba, and re-curve up to Florida — This is what Hurricane Charley did in 2004. Or, (d) the Storm will blow a bit north, and will head for Bermuda, and depending on how it interacts with Bermuda, it may also impact the east coast of Florida. Usually, when Hurricanes hit land, they slow down, or stop altogether. But it depends on whether the Hurricane is hitting flat, humid, rain-soaked land, which can recharge a Hurricane, or if it hits a Mountain, which usually stops it. Decide what to do: “Shelter-in-place, or “Bug out”. This is the key point of hurricane planning, and it is best to decide this as soon as possible. This is a family decision, based upon your circumstances: Where do you live, what do you live in, who lives with you, how big is the storm, and where is it predicted to go? Ideally, you will have thought about some of this months ago. But circumstances change, and so do people’s tolerances for risk. Here’s how the planning decision gaming scenario goes: If your family is all healthy, and you live in a house, and you aren’t on a barrier island, and if the windows of the house are all storm-rated, and, if the storm is only expected to be a tropical depression, and depending on the predicted track of the storm, then, you could probably ride out the storm in your house. This is also called, “sheltering in place.” BUT, let’s look at this some more. Assume that during a storm, you will lose electricity and maybe your phone service, with the length of this interruption dependent upon the severity of the storm. If anyone in your family has special needs, you’ll have to plan for their needs, ahead of time. Do they just need a generator, to ensure that some appliances will work, or do they need more specialized care? Plan for it. By the way, if your community has a Special Needs registry, you may need to renew that, annually. If you are in a house, you can generally stay there during most storms. But if it is a mobile home, you should plan to evacuate before a storm. If your house is on a barrier island, you will probably be ordered to evacuate. If ordered to evacuate, go. Having storm rated windows is important. Windows installed after Hurricane Andrew (1992) must meet strict Florida Building Codes, and those codes are getting stricter each year because the storms are getting bigger and stronger. (Let’s say it in unison, “CLIMATE CHANGE.”) If you are in an older house with the old jalousie windows, you will need to board them up. If it is predicted to be a bigger storm, with winds over 74 miles per hour, and you just aren’t sure you want to deal with having no electricity for a week, then you should consider evacuating. Storms come in several sizes, based upon wind speeds. There are four categories of storms, as described on the NOAA Tropical Prediction Center website. There are Depressions, Storms, Hurricanes and, Major Hurricanes. 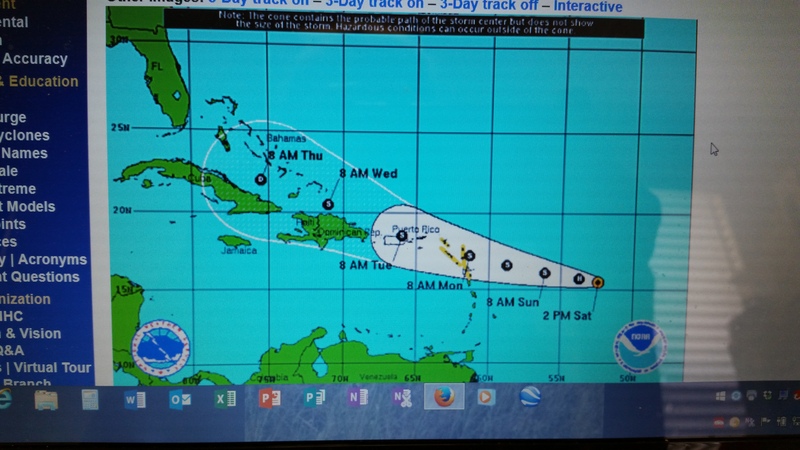 D: Tropical Depression – wind speed less than 39 MPH. M: Major Hurricane – wind speed greater than 110 MPH. Let’s Talk About Storm Tracks, before you make tracks. In Florida, storms either come across the State from the East Coast, or they come across from the West Coast. Those are called “entering” or “exiting” storms, and that depends upon your perspective. Or, they go up either of the coasts, which is called a parallel storm track. In all of these cases, the important thing to research is where the eye of the storm is, in relation to your house, and to your proposed evacuation routes. Where will the storm make land fall? Your evacuation route, will depend upon that, too. The most important thing to do is, leave before you have to go! Ideally, you will be on your way, before the roads get too crowded, before everyone is panicking. And, before we leave this point, remember these things: Once you are in the range of a 5 day storm prediction, it is a good idea to get a full tank of gas. But please, don’t run to every gas station to “top-off” your tank, because that creates runs on gasoline, and shortages. Having a full tank of gas should give you better traction, and, will allow you to get out of harm’s way, when you evacuate. Next, you should review a road map, and check weather conditions along your proposed route, before you head out. You may want to reserve hotels in two different areas of Florida, so that you can have greater flexibility. (Remember to cancel the room you aren’t using. You may have to pay a cancellation fee, but you will probably feel like it ‘s worth it.) Remember to get some cash before you travel, since the power may be out on your return trip, and cash is best then. Remember to tell a family member where you plan to go. Storms can change tracks suddenly and without warning. And remember, hotels are not immune to the impacts of Hurricanes. It won’t hurt to look up the location of hurricane evacuation shelters in the counties along your evacuation route. Finally, sit with this meditation: Prepare for the Worst and Hope For the Best. Years from now, when you look back on this Hurricane, and you will, trust me, you will have so many stories to tell! Hurricanes move heat and water around our Mother Earth. They are a vital function on our dear planet. Let’s Share Peace With Our Earth. ~WhaleMaiden, with grateful thanks to NOAA & the Tropical Prediction Center. Ok folks, we know it is HOT here in Southwest Florida and HOT there (I’m pointing to the middle of a little Map of the USA) and we know that this big blob of hot air is moving east (that a way –>) across the USA. What’s it gonna take to cool it all off? You won’t like this: It will take a Hurricane. Hurricanes assist the planet in moving hot and cold around. Hot air, hot water. Cold air/ cold water. We are in Rainy Season which started on Solstice, and we are heading into an early Hurricane Season. So, make sure your Hurricane Plans are up to date. We went from a high of 85-95 degrees two days ago, to a high of 70 or so today. Hurricane Season is ending, the Dry season is coming. Everybody I spoke to today was happy about the cold front, because it meant we could wear our sweaters — yes, it is “Sweater-Weather” day in Southwest Florida! I believe that the storms and hurricanes that occur in the earlier part of the Atlantic Hurricane Season, (June-July) are realitively small compared to the ones that develop later in the year. So, that is why I divide the Atlantic Hurricane Season into “Rainy Season,” and “Hurricane Season” in the Florida Earthways Path.